I thought about this because I saw a related story of rising suicides in Tamil Nadu and there was a set of people mentioned as being entrepreneurs who end up committing suicide. There was a detailed summing up of the factors especially when they fail and how they actually end up not having the strength to face the world. I think this factor is often a result of our education system which only celebrates mediocrity of getting marks and that alone as a yardstick of one’s achievement. No where are we allowed to fail in a sense that we tried and failed. The worst part about the exam is not even the challenge to your brain except muggin up and getting your answers right. While talking to one of my friend who is a professor, he was surprised to see a set of students had only mugged the answers to a set of questions and they were sure that they examiner is not going to even twist the question. So if they come across a set of four options they knew the answer for sure irrepsective of the question. Like I said the question cannot be changed. Imagine if Thomas Alva Edison did not continue after numerous failure, would we have been working with electricity and a bulb to shine in the night. It was also very sad to read that people who fail at entrepreneurship take to the drastic step of ending their lives. The most important trait that we need to instill in our children is the removal of fear of failure especially in terms of what holds for the future. We need to celebrate the idea of entrepreneurship so that people take easy steps to it. I know its easy said than done. But you got to stand in ovation for all those who chose to be entrepreneurs in their own right. For me every vendor who comes to our door step is an entrepreneur who has a risk attached to his every day livelihood and where there are no paid holidays. I used to be inspired by those people who carry themselves out of bed so that we can smell the coffee, those who are out of bed so that we can read the newspapers, the drivers who drive night shifts so that the milk would reach the nearest booth for us to have the coffee. There are in-numerous people who are entrepreneurs who help us in our endeavors. I have come across many people who handle multiple business with ease and also happen to do a lot of good work in their chosen field. So why do people take hasty decisions when it comes to failure. It may be monetary in a way but thats the way we have been taught perhaps that monetary achievement far exceeds a successful trial of an entrepreneur. We need to instill a sense of achievement for the students to understand the reality and success and failure are two sides of a coin. 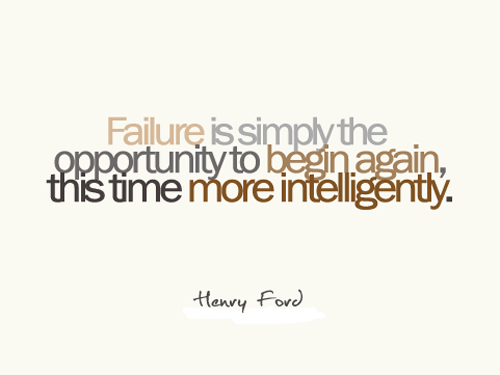 Then ofcourse make them understand that failure is the stepping stone to success. To make this happen always make it a point to compliment any entrepreneur you come across in your day to day lives. Entrepreneurs are a rare tribe and if not for them lot of people would lose the jobs. You are one of the rare persons who respects entrepreneurship irrespective of the results. Most persons care only for results. If an entrepreneur succeeds, (s)he is praised and even worshipped. If (s)he fails, nobody wants to be associated with her/him. That’s not the main point, though. The main problem is, while big business houses are permitted to squander hundreds and thousands of crores of bank money, small entrepreneurs can get bank finance only if they offer personal property as collateral. If their business fails and they are unable to repay bank loans, their property is attached. No ‘revival packages’, ‘loan restructuring’, etc. for small entrepreneurs. The pressure is tremendous. Having said that, suicide is not the solution. Thanks for your kind words, and I agree 100% with you, there needs to be a rationalization on the small entrepreneurs! I am sure we will have to make our voices heard and make amends. I am sure there are ways we can overcome though there is no real help coming at teh most important time. Lets hope for the better.